A foundation of Jean-Michel’s ability to create highly crafted backgammon and other game boards is his work as a furniture artisan. Jean-Michel serves residents of the Hamptons and Manhattan; bringing European attention to technique and detail, as well as an artistic eye, to all his work. All projects are mastered personally and only by Jean-Michel, so that he can ensure control of the quality. 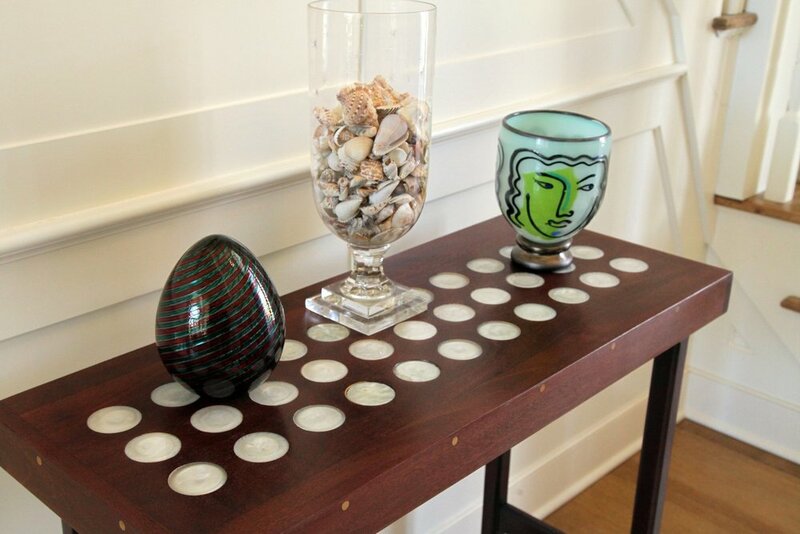 Custom Furniture: Sometimes, it just can't be found in a store-- it's in your head and you'd like it just right, just that dimension, just that finish. That's where Jean-Michel comes in, creating customized items to bring your vision to life. Furniture Reimagining: One of Jean-Michel's specialities is taking a piece that is past it's prime and give it new life with a creative, artistic twist, using unexpected materials and applications. 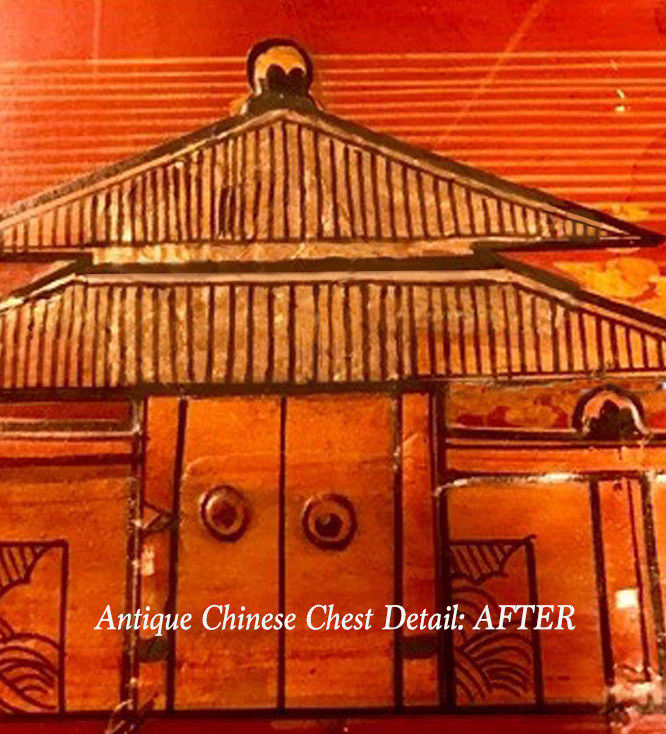 Furniture Restoration: Careful restoration of the original splendor of beloved pieces, using time tested techniques and intense attention to detail. 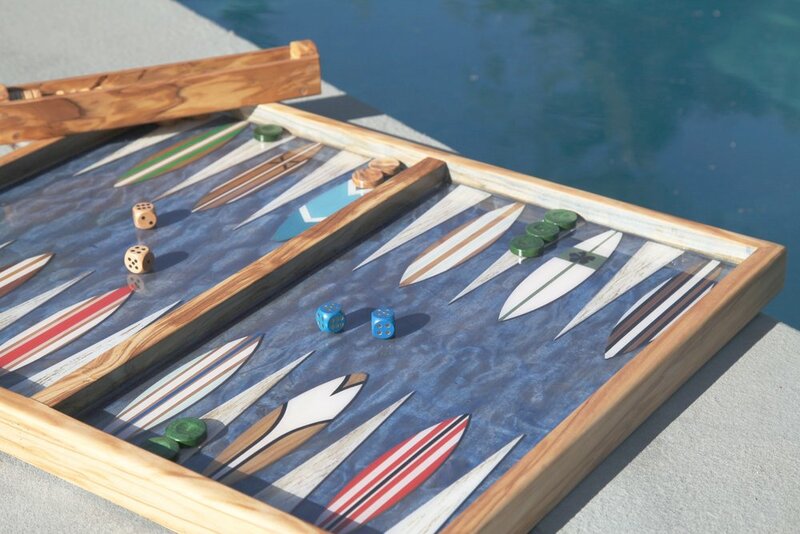 Backgammon With a Twist: Luxury custom backgammon boards with a delightful "twist" on this traditional game. These pieces of functional-art are hand made with exotic woods and quality craftsmanship, and can be customized and personalized. 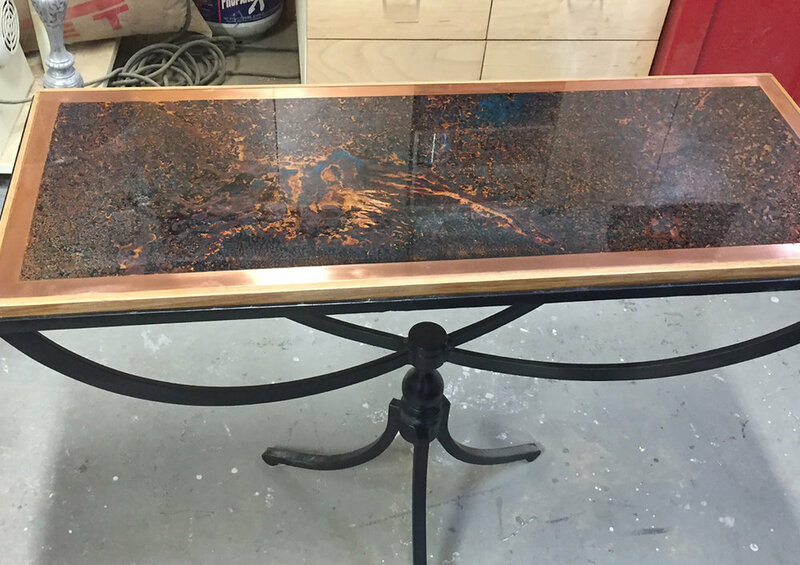 Console table top of copper that has been hand patinaed to a mesmerizing tigers eye effect. Very damaged table restored and pewter accents added; for Pierre's Restaurant, Bridgehampton. 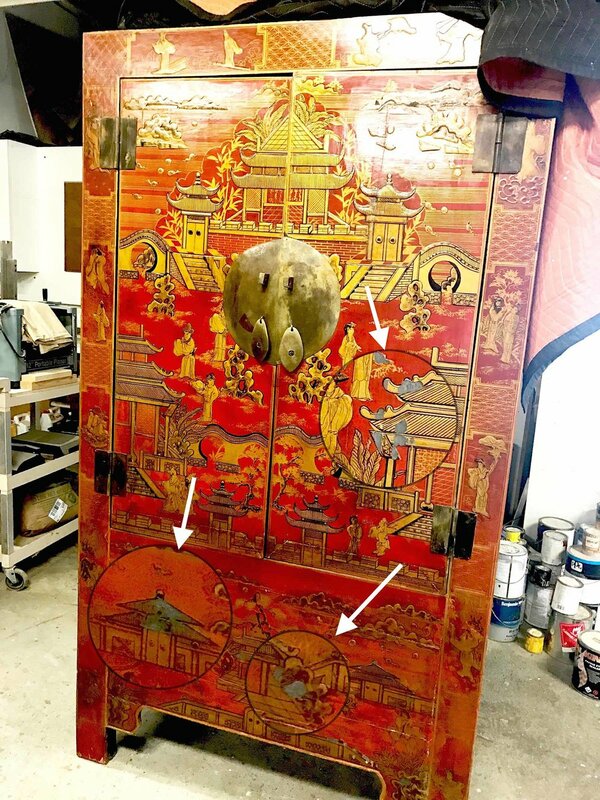 Client brought in this beautiful antique piece for refurbishment— with the goal of maintaining the pieces antique charm and color, but repairing and replacing so it functions well. Lined the drawers with wallpaper client requested. added a trim to keep it clean looking and last longer. 1970's Milo Baughmann Pony Sofa had been wrapped in broken cork. I wrapped it in copper that I hand patinaed into a mesmerizing cork type finish. Detail of side of sofa; hand patinaed copper with bronze and turquoise colors. ...was transformed into a sunroom gem with pearlized resin. 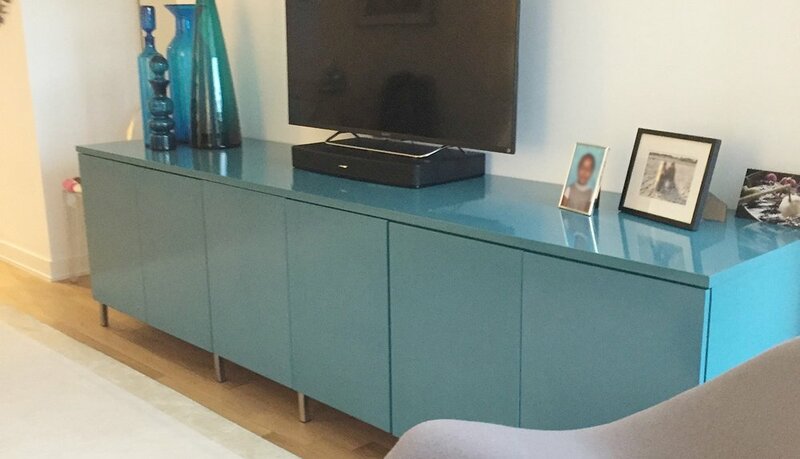 A good quality but dated bridge table needed a reinvention to fit into a bright corner of a Southampton home. Now it's lighter, artistic and functional with pearlized resin playing surface. If you'd like Jean-Michel to take a look at a piece that might need a creative fresh take, please contact him.